Are you tired of short nails, but want instant results? Do you have a special occasion? Do you want your nails to have the same shape and length? Are biting your nails, but want to break this habit? If you answered yes, to any of these questions, you might be interested in acrylic or gel nail extensions. Acrylic and gel nail extensions are nail enhancements that will give your nails desired length and durability instantaneously. These two products have slightly different characteristics, and below are some of them. Acrylic was the original nail enhancement product, it is a powder and liquid system. The mixture of powder and liquid is applied on the natural nails extending them over the paper form or a tip, depending on the extension type. The mixture hardens with the help of the heat generated by client’s hands and temperature of the room. UV lamp is not used for this system, client does not experience heat sensation as she would with gel system. Acrylic nails can be removed easily, they can be soaked off with acetone. 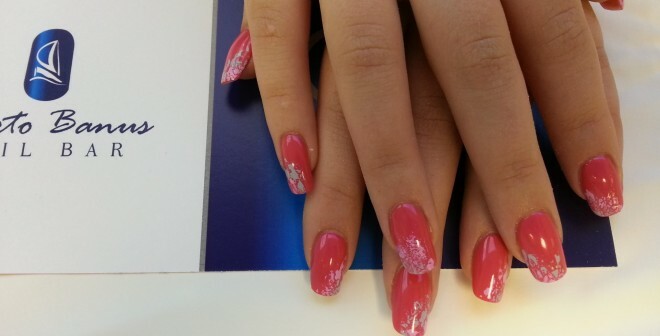 Acrylic nails are more durable and suitable for someone who is hard on their hands. This type of nail enhancement is not suitable, for someone who has very moist hands and nails. Its great for severe nail biters. Gel is derived from the same chemical family as acrylic, but it is differently processed. Gel hardens with the help of UV light, so every layer has to be cured in a UV/LED lamp. The hardening process causes heat release, so client might feel heat sensation for a brief period of time. When nails are thin and damaged heat sensation is felt more intense, so it is not recommended for someone who has sensitive nails. Most gels have to be filed off when they need to be removed. Gel doesn’t have strong odour, is a softer and more flexible product, if compared with acrylic.